Two of the persons involved in the development of Lifestart trolley (http://www.inditherm.com/medical/neonatal-resuscitation-lifestart/) has published a review in Maternal Health, Neonatology and Perinatology. 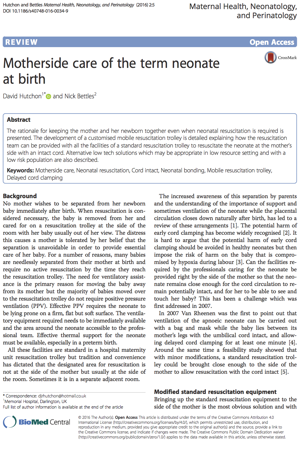 "Abstract: The rationale for keeping the mother and her newborn together even when neonatal resuscitation is required is presented. The development of a customised mobile resuscitation trolley is detailed explaining how the resuscitation team can be provided with all the facilities of a standard resuscitation trolley to resuscitate the neonate at the mother’s side with an intact cord. Alternative low tech solutions which may be appropriate in low resource setting and with a low risk population are also described."